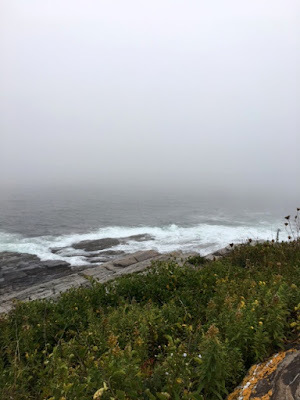 I'm leaving for Vermont today. 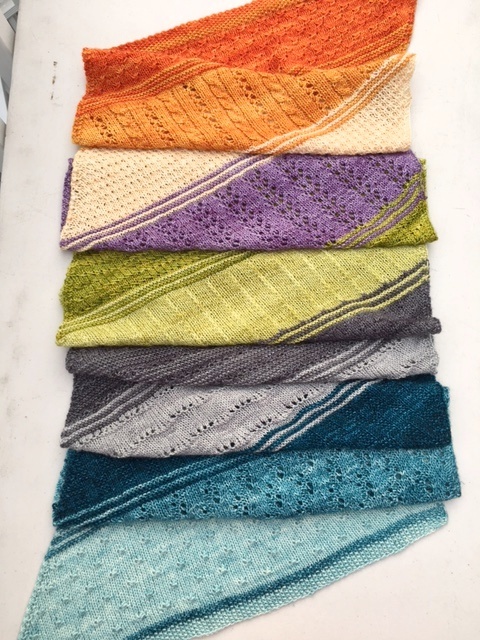 The truck is loaded, my suitcase is still empty and I'm undecided about my knitting projects. I can take care of the suitcase in about ten minutes, but I've been pondering the knitting for a day or more. I went to bed last night and told myself I would figure it out with a fresh cup of coffee. This morning, after I had fueled up with coffee, I decided to bring this along for the ride. This might not be the best travel knitting, but I'm up for an adventure. I probably should pack a sock project too in case this backfires. 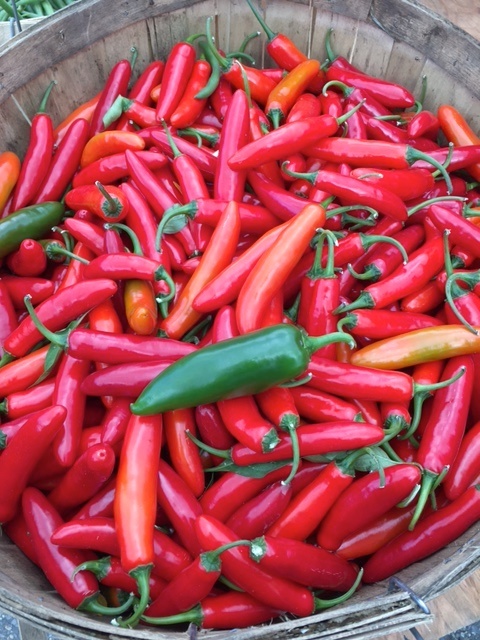 The farmers' market is starting to wind down, but there are still some vibrant colors. This week's color inspiration . . . I'm deep in show prep and have just enough time for a quick post. Today's tip. If you're heading to Vermont Sheep and Wool this weekend, take time to see Sheep Breeds: A World of Difference. This display has a wealth of information about various breeds, but even if you're not into the nitty-gritty details, give it a look. You won't be disappointed. That's all for today. There's more yarn to pack. Usually knitting patterns ask you to knit a certain number of rows or inches. Count the rows. 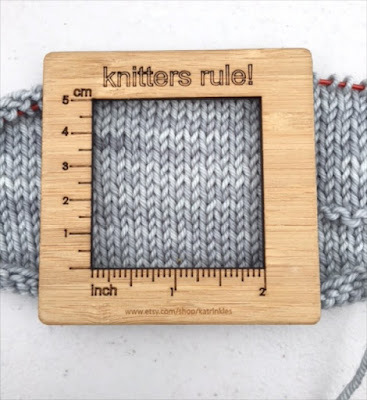 Measure the inches. Pretty straightforward. 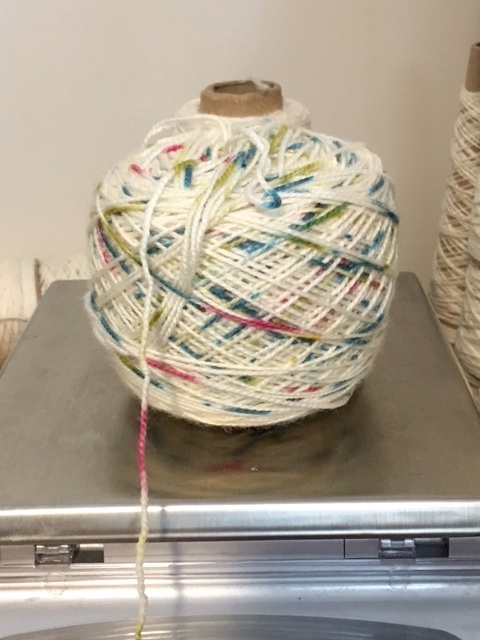 And then every once in a while there's a pattern that has you knit according to the physical weight of your yarn. I've been working along on my Down The Road and Back Again. 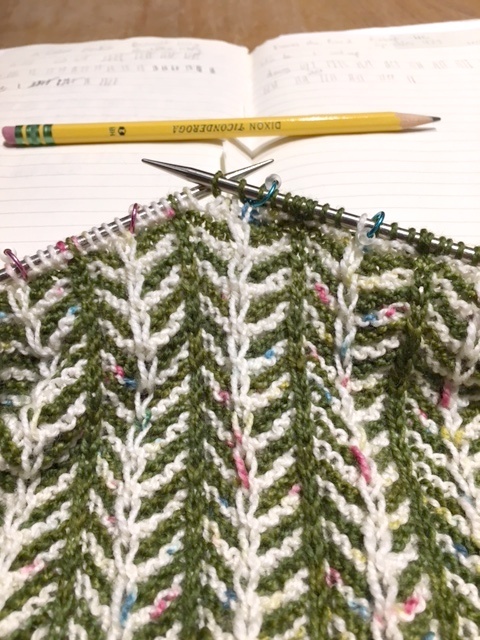 I'm still not sure of all the twists and turns in this pattern, but I'm OK with that. 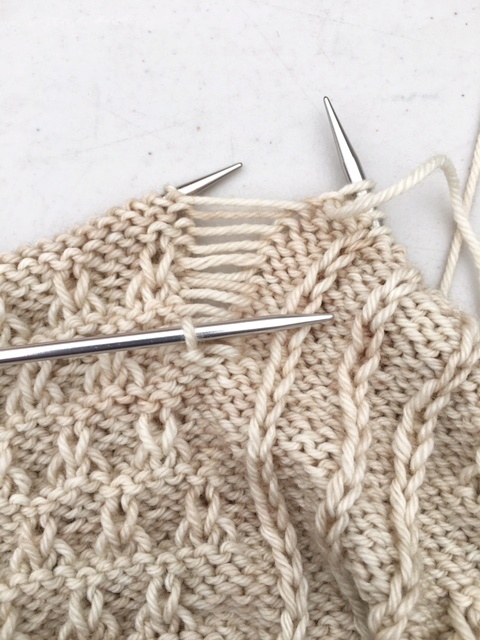 Sometimes knitting requires blind faith. 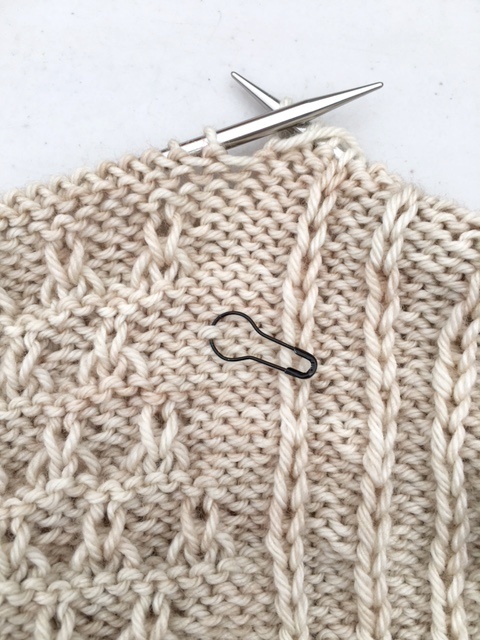 This pattern also has you knit a percentage of the yarn before moving along to the next section. I understand the reasoning behind this. 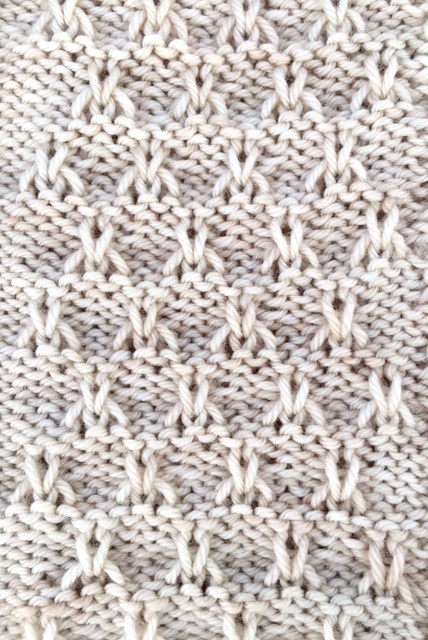 The pattern can accommodate different amounts of yarn. The whole concept is pretty clever, but it makes me slightly frustrated. Counting and measuring are easy and give up-to-the-minute progress. Weighing, on the hand, isn't accurate in the moment unless you want to pull out the scale every few rows. I hadn't weighed my yarn since I started this project, so this morning I decided to check in. I still have 25 grams to go before I can move on to the next section, but that's not so bad. 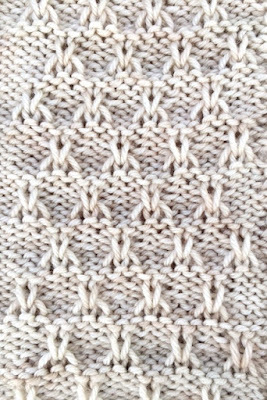 Now I can estimate how many rows I still need based on how much I've already done. I'm feeling better about the situation. 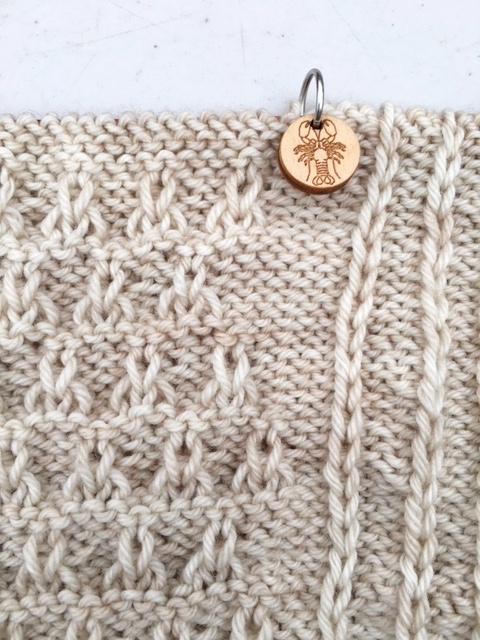 I've figured out a way to count rows even though the pattern is based on weight. 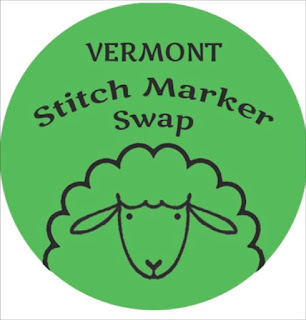 I'm busy pulling everything together for next weekend and Vermont Sheep and Wool. As part of my show prep, I have this going on. 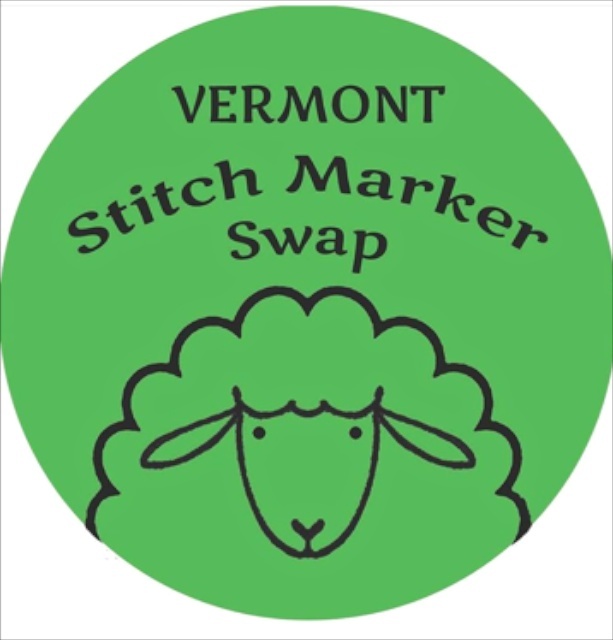 Attendees and vendors will be swapping stitch markers all weekend long. It sounds like fun. If you're going and want to get in on the action, see the website for details. 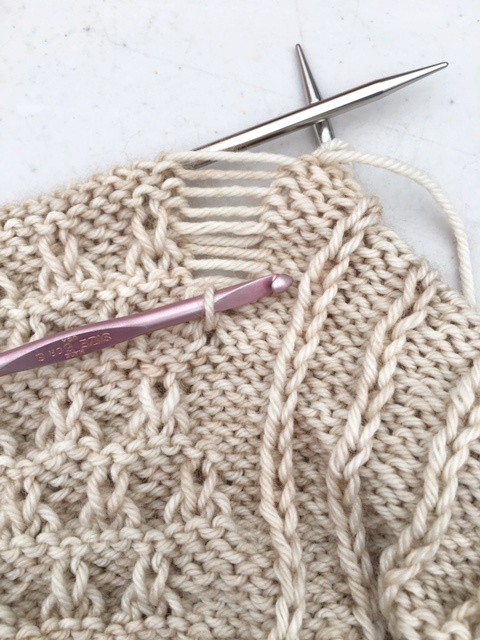 I found my rhythm and am cruising along on one of my new projects. Down The Road and Back Again Shawl, in case you're interested. 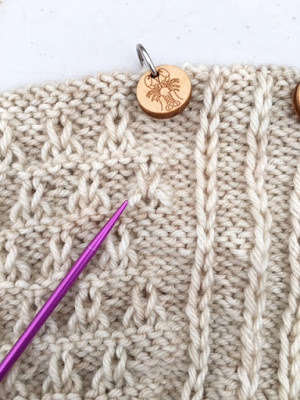 Slip stitches are magic. I caught this week's color inspiration just as the fog was rolling in. Yesterday my to-do list included casting on a new project. I didn't get to it during the day, so when I left the house for knit night, I grabbed the necessary ingredients. I settled in with my knitting buddies and cast on a wee swatch. Generally I'm a firm believer in swatching, but I'm not going to extol the virtues of this "optional" activitiy. 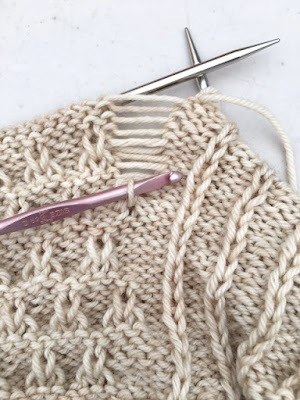 Knitting a swatch is not a foolproof exercise, and sometimes it's an out-and-out lie, but it has saved me on numerous occasions, so I usually take time to do it. 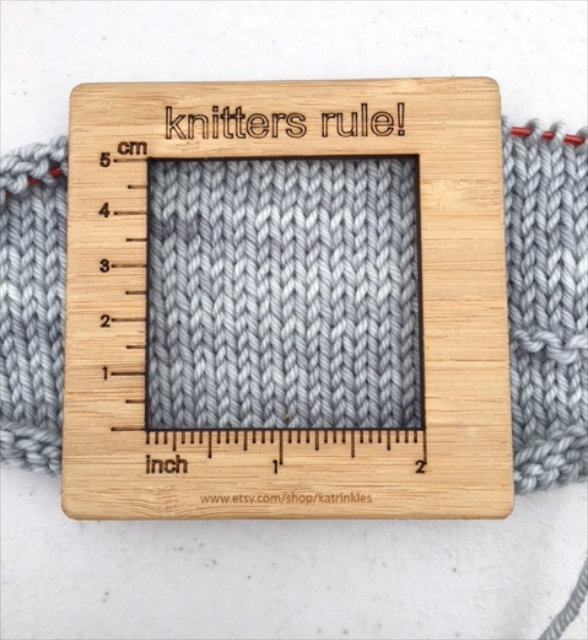 After I knit my swatch, I wasn't quite satisfied, so I decided to go up a needle size. I rummaged through my bag only to discover I didn't have the needle with me. I was tempted to cast on anyway but decided to wait. I'm glad I did. This morning I swatched with the bigger needle, and I'm happy with the result. Definitely worth the wait. Since I finished my Beekeeper Cowl last week, a new project was in order. This week is off to a slow start, including this project. 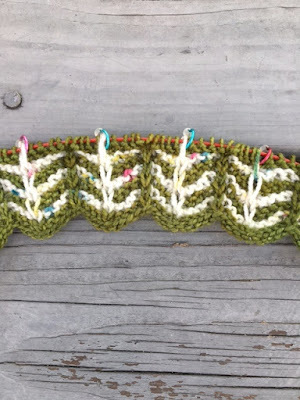 I still haven't mastered this 4-row repeat and have had to tink back a couple times. 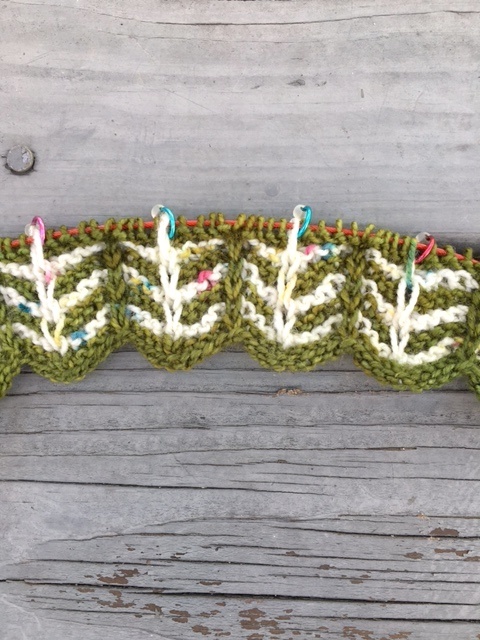 I'm sure I'll get the hang of it after working a couple more repeats. The bees are all accounted for. 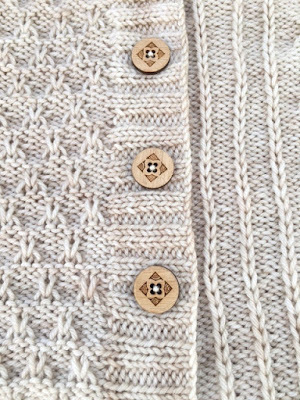 This sample is blocked, buttoned and finished. Once I had the bee situation sorted (see previous blog post), I was motivated to finish this project. Picking buttons was a tough decision. I had two strong contenders. When a random social media poll came up with a 50-50 split, I went with my first instinct. This was an entertaining project. And if you don't lose track of your bees, it's a breeze. 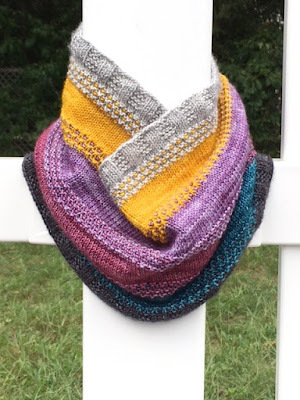 The yarn is Lucia DK, colorway Biscuit. Look for it at fall events. 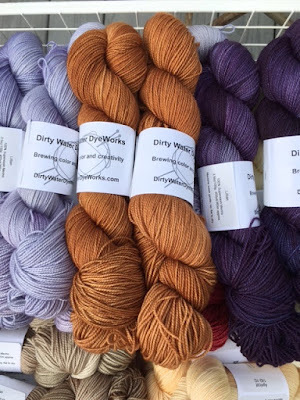 This blend is a current favorite, and I already have another project waiting in the wings. Website update. There's still space available in the Yarn Knot club. New format, lower prices . . . follow the link for details. 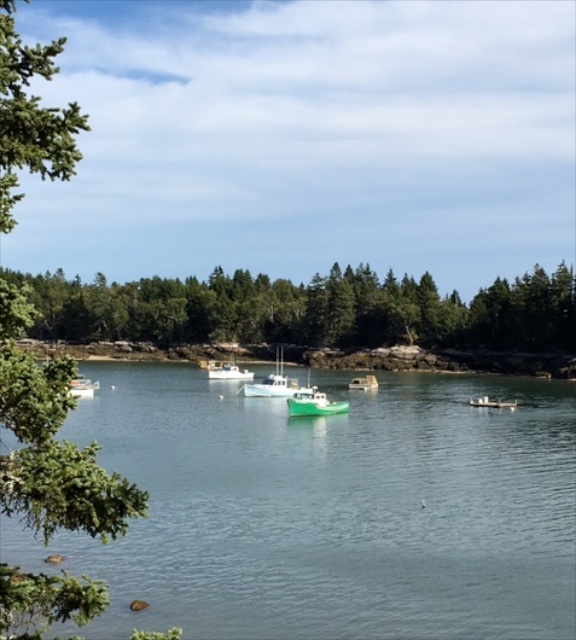 A speck of bright green. 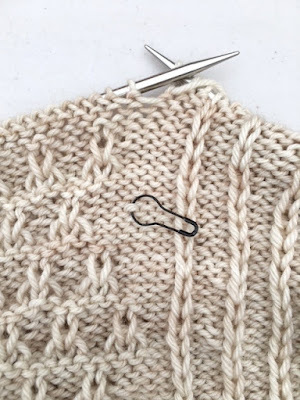 Knitting mistakes can be a good indicator of a knitter's perfectionist tendencies. 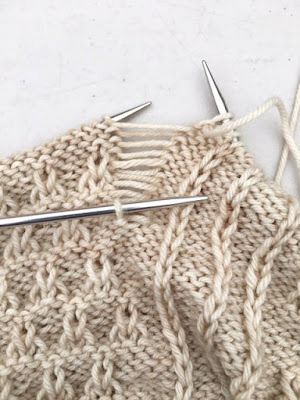 I'll be the first to admit that I make knitting mistakes. 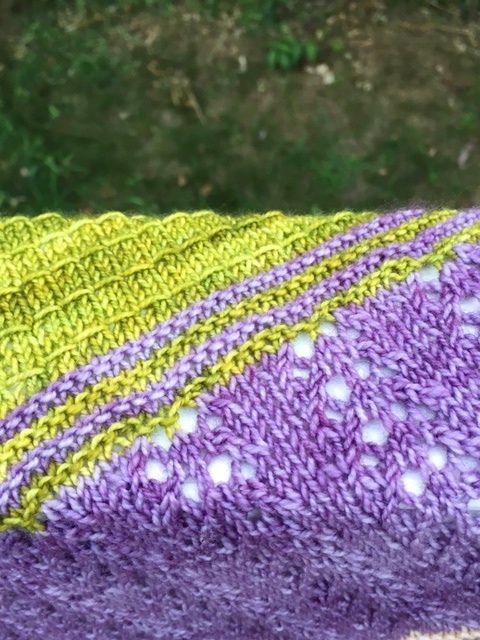 Sometimes I even spot them before I bind off. Then I go through a series of questions in my head. ~ Can I live with that mistake? 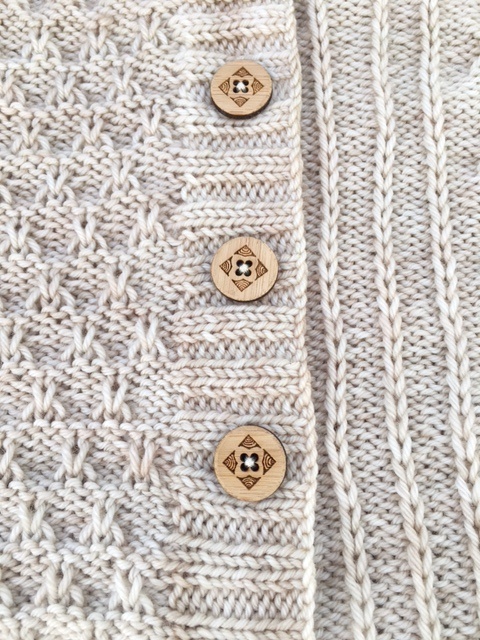 I always tell my knitting students if you don't point out a mistake, chances are no one else will even notice it. ~ If I can't live with it, how am I going to fix it? ~ Do I have to rip back? ~ Can I somehow manipulate the stitches on the needle to fix the problem? 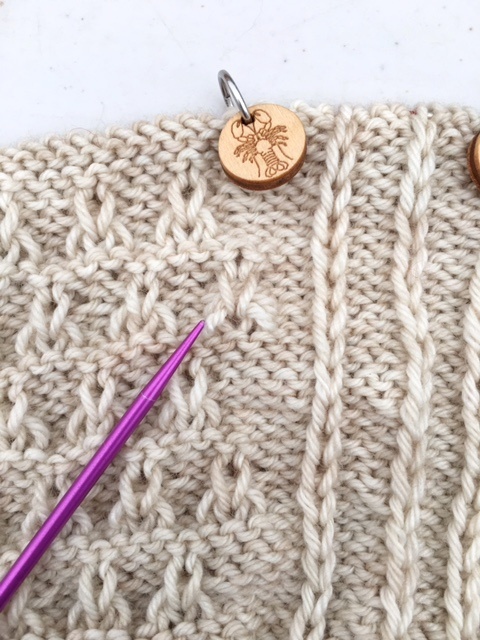 I was working along on my Beekeeper Cowl when I noticed a glaring mistake. Or at least it was glaring to me. See the empty space below the marker. There should be another bee in there. 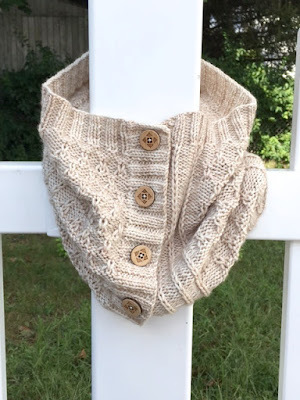 This cowl has two more panels just like this one. In my defense, I was consistent and omitted the bee in the other panels too. Three missing bees. 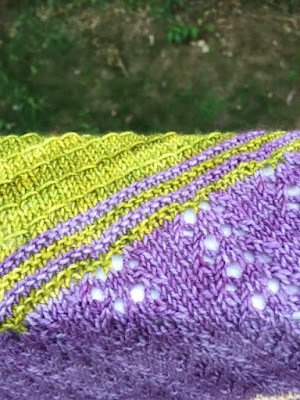 I was tempted to pull the needle out, rip back twelve rows and re-knit them with the correct number of bees. 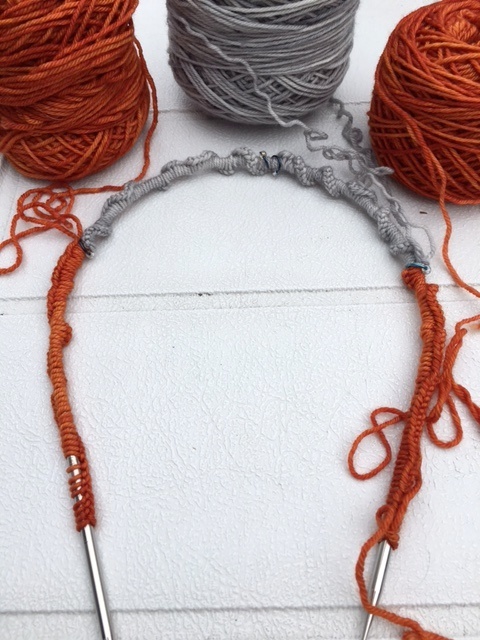 Never underestimate the therapeutic value of pulling on a strand of yarn to erase mistakes. Instead I took a moment. 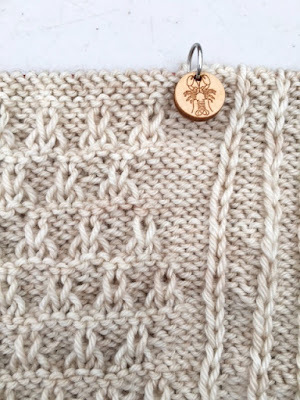 I set the project aside and started to visualize how the bee stitch is made. Could I drop down and recreate it without frogging twelve rows in the process. I decided to give it a try. If it didn't work, then I would rip back. I marked the row I was ripping back to. 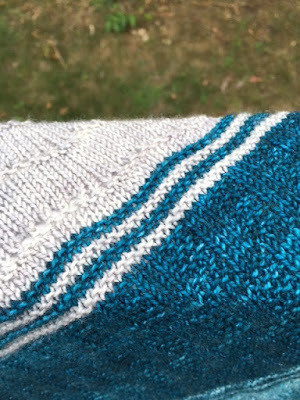 Then I dropped the stitch twelve rows. I made the bee stitch and used a crochet hook to work the stitch back to the top. Success. I knew I couldn't live with this mistake. I'm just thrilled I could fix it without a lot of extra time and effort. Now back to making more bees . . . In the midst of a couple topsy-turvy days and a quick trip to Maine, I managed to knit a few rounds here and there. It all adds up in the end. 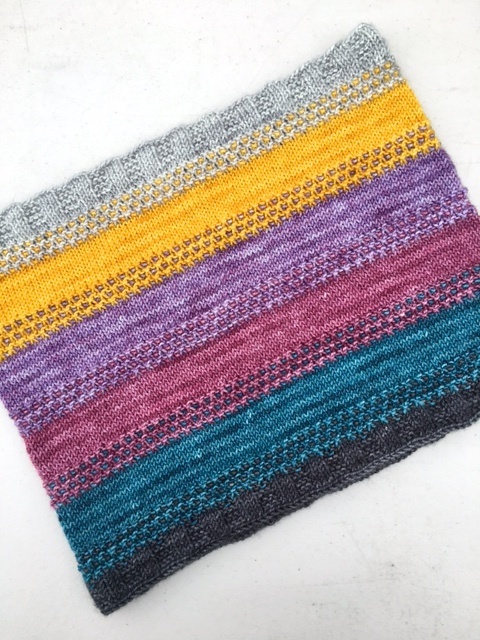 I've made this pattern before, and it was just as much fun the second time around. This time I made the shorter version and used a new Mini Multi Bundle. These bundles aren't on the website yet but will be available at fall shows and events. Speaking of the calendar, I just updated the right sidebar with a list of coming events. Click on the links for more details. It's a double Sunday - my daughter's name for Monday holidays. So far it's been a productive weekend. This was a MKAL with two clues released every week for six weeks. Twelve colors, twelve different sections. The clues were manageable, so it was easy to keep up. The sections had a lot of variety . . . an entertaining project all around. 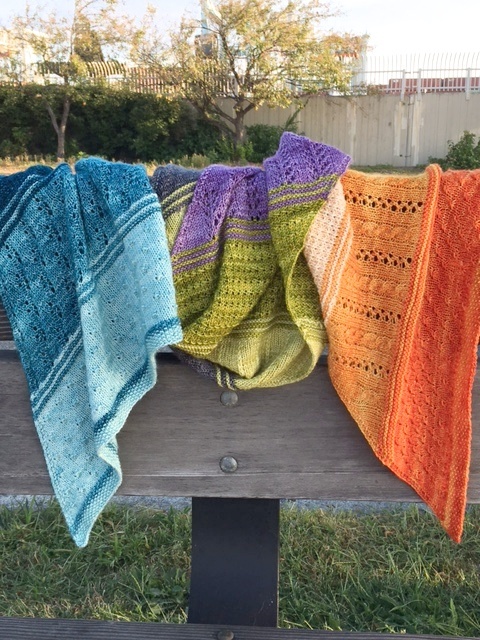 If you missed out and want to get in on the action, there's a KAL starting on September 10. You'll find this color combination and other options here. And now I'm off to enjoy my double Sunday.